Skeletal Dragon is a legendary Endurance creature card. It is part of the Heroes of Skyrim expansion. This card's summon ability applies the Beyond Death card effect. The Skeletal Dragon first appeared in Skyrim. 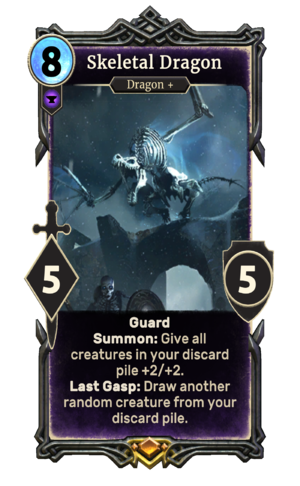 The card's creature type was originally solely Dragon, until the Skeleton subtype was added in Patch 1.68.0.